Are you escaping for a winter break soon and wondering what to pack for it? 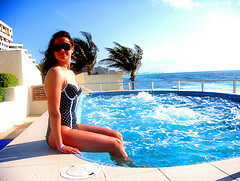 Well you better pack a swimsuit for your escape as jacuzzi’s may be part of your escapades. Just because the winter months are approaching it doesn’t mean you won’t need a bikini. If you are going to shop for a winter bikini these tips might help. Going shopping for winter swimwear can be a bit daunting. Choose a day to shop when you are feeling good about yourself, because this makes all the difference. If your skin is pale then a little bit of fake tan helps with your confidence too. Before your trip try a sun safe spray on tan to get you back into the prime time summer spirit. Before you go shopping you may want to consider investing in some beauty treatments that will make you feel even better. Pampering can help you get ready for the body exposure. Try waxing, hair removal, a spray tan or exercising every day for a few weeks before you hit the stores. Three pounds down is better than three pounds up when it come to having to try on swimsuits. If you are going for a bikini and have a unique figure, try to buy from brands that sell separates. While it may cost a tad more, purchasing separates is a great way to get the perfect fit. Not everyone is the same size on top and bottom. If you are a D cup+, then you should buy brands that are designed for bigger busts. These swimsuits are sized like bras and they ensure a better fit. Inversely, if you are pair shaped you can buy a smaller dainty top and then with separates get the large size bottom or a different style with ample coverage. You can mix and match for a small but because bikinis with ruffles or frills on the top paired with plain solid bottoms give your figure a good balance. This gives the effect of adding size to your chest, without having to wear bulky and obvious pads. Finding the right cut swimsuit is key. You may not always want to cover your worst areas in fabric as this accentuates them. Instead, focus on accentuating the positives because this minimizes the negatives. For example, a higher cut bottom may be more revealing but if it gives the illusion that your bottom is smaller than it might actually work. Finding the right fabric and cut is key. The cut of the leg is also really important for looking slender. Get a slightly higher cut leg if you’re on the shorter side, as this helps to add length to the legs. You can also wear with a wedge heel sandal instead of a flat to make you appear taller. A neutral color sandal works well for elongating the visual of the legs. Don’t be obsessed with following trends or buying kitschy colours and prints. Choose what suits your colouring and skin tone the best. Darker colors are universally slimming and you can use print to disguise areas or create curves. If a classic clean-lined mallet looks great on you, then stick to the classic. Go for what looks amazing rather than what the latest style is. The weather is cooler which means you can cover up and that can be a good thing if you feel overweight. Make sure to choose flattering cover ups. You want to feel comfortable in the heat or colr hair so nothing too tight. Avoid moo-moo styles that make you look like a tent as that only exaggerates your size. Try fashion that you can wear from the beach right to bar. Silky sweats/leggings or a t-shirt dress can be dressed up with some jewelry and high-heeled sandals. Think versatility when packing items because you want to travel light. Invest in a well-made bikini, because in winter you are more apt to go into heavy chlorinated jacuzzi. You don’t want the fabric fading or stretching out on you. If you look after a better quality and more expensive swimsuit, it will last longer,and often fit better the cheaper counterparts. To keep your swimsuits shape, rinse off after swimming to remove salt and chlorine. The elements can destroy Lycra so if your swimsuit is delicate you may want to wash it with a mild soap, baby shampoo or a cap full of Woolute. Spend some time trying on swimsuits and don’t get discouraged. You can expect to try on 20-30 swimsuits before finding a good one. If you are shopping online select a reputable shop with a good return policy. Read the reviews and give yourself ample time to execute returns. Something that looks good and has great reviews may not work when you get it home. It can help to try on as many shapes as possible to find the perfect one for you. Even if you plan to shop online, go try on some different styles at the local department store so that you have some idea of what styles suit your body type. This will minimize the potential for having to ship back returns and ask for exchanges, which we all know is a headache.